The strategic and well-informed inclusion of the private sector in climate change adaptation planning and activities must be a key part of all countries’ efforts to adapt to the impacts of climate change. Photo by iStockphoto. Adapting to the impacts of climate change, whether at the national, sub-national or community level, is not the responsibility of national governments alone. It requires the coordinated input of multiple stakeholders, including local authorities, development partners, communities and civil society. Businesses and investors also need to be involved, as they are the key engines of economic growth in developing countries, accounting for 60 per cent of gross domestic product, 80 per cent of capital flows and 90 per cent of jobs. The private sector will be relied on to create the jobs needed to support adaptation, to develop the products and services needed for societies to become more climate-resilient, and to finance—directly or indirectly—many adaptation actions. The strategic and well-informed inclusion of the private sector in climate change adaptation planning and activities must be a key part of all countries’ efforts to adapt to the impacts of climate change; they will be key partners in the design, financing and implementation of adaptation priorities. The National Adaptation Plan (NAP) process offers a medium- and long-term vision of national adaptation action, aligned with development plans and with a supporting regulatory and policy framework. It therefore can provide all stakeholders, including the private sector, with a stable and predictable roadmap for a government’s priorities on national adaptation. The NAP process presents a critical opportunity for governments to align private sector interests with national adaptation priorities. Proper alignment would facilitate a longer-term scaling up of adaptation activities across wider networks, distributing ownership among more stakeholders, and ultimately becoming more representative, inclusive and successful. This study* aims to offer guidance to governments and their partners on how to engage the private sector in the NAP process. Private sector engagement in the NAP process, for the purposes of this paper, is defined as the meaningful involvement of private sector actors—ranging in size, sector, motivation and whether they operate in the formal or informal sector—in the planning, implementation, and monitoring and evaluation of national adaptation planning processes. To outline the enabling factors that facilitate private sector engagement in NAP processes, namely information sharing, financing, institutional arrangements and capacity building. To offer practical guidance on how countries can design their NAPs to ensure that the private sector is engaged across the three phases of the NAP process: planning, implementation, and monitoring and evaluation (M&E). To provide examples of instances where the private sector has successfully engaged with the NAP process, as well as with climate change adaptation more broadly. *Download the full study from the right-hand column. A brief overview of the key findings is provided below. Private sector actors differ in size (micro, small, medium and large), sector, motivation (for-profit, private charities, social enterprises) and whether they operate in the formal or informal sectors. Micro, small and medium-sized enterprises (MSMEs) tend to dominate the private sector in many developing countries, and as such are key actors for engagement. Private enterprises, within the context of the NAP, are those companies that could or do supply the services and products that build climate resilience to support NAP priorities, and that invest to enhance their own climate resilience and reduce their climate risks. Private financiers, on the other hand, can provide direct financing to private enterprises for adaptation action, and can support government interventions through public–private partnerships. They include private commercial banks, microfinance institutions, insurance companies, institutional investors, private equity and venture capital investors, private foundations and charities. Manage risks for business continuity and reputation. Capitalize on new markets and business opportunities. Comply with policies, regulations and investors’ interests. There are a number of factors that governments, with the support of development partners, civil society and private actors, can put in place or strengthen to enable and incentivize the necessary level of private sector engagement in the NAP process and in the pursuit of adaptation commitments listed in a country’s NDC. These factors can help address the barriers that commonly inhibit private sector engagement in adaptation processes, barriers that can be informational, financial, technical and institutional. Governments designing their NAP process should work to address (where possible) each of these enabling factors. 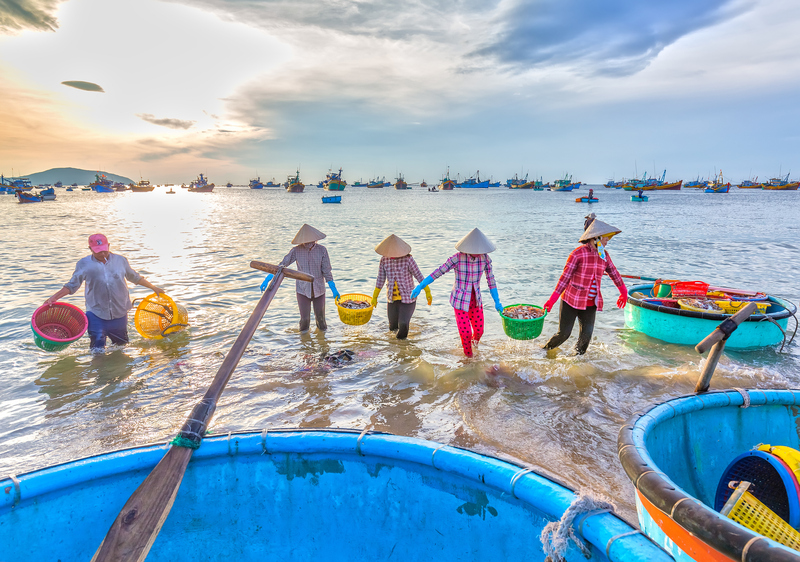 ​There are three main informational barriers to private sector engagement in adaptation: understanding the need to adapt to climate change; understanding the changes that are being adapted to; and understanding how best to adapt. Governments play an important role in both generating climate information and facilitating its sharing—strong climate information will, after all, be foundational to adaptation planning. Working with development partners and civil society, they can also start to address knowledge gaps by publicizing and promoting best practices in adaptation, promoting peer learning, and highlighting lessons learned from past adaptation actions and programs, whether good or bad. Governments should also work to communicate information on climate vulnerability, risks and adaptation options, using terminology and concepts familiar to the private sector. They must also clearly articulate the business case for adaptation actions: they can make it clear to private sector actors that climate change could fundamentally alter the economy and that there could be significant risks to inaction, while also stressing that opportunities may emerge as a result of climate change. The financial barriers to engaging in the NAP process include those related to accessing financing to pay for adaptation actions and ensuring that appropriate financial instruments are available to those who need them. Where markets are not functioning in a way that encourages (or allows) the private sector to invest in efforts to increase their resiliency or develop new climate-resilient products or services, public intervention may be required. Governments can use financial incentives to motivate private sector actors to invest in new products or markets that support adaptation and meet NAP priorities. These financial incentives for investing in NAP priorities can include: tax breaks; risk guarantees; government procurement contracts that help to secure demand for new climate-resilient products and services; and favourable conditions set by export credit agencies to make investments in climate change adaptation more attractive. Governments can also use mechanisms like taxes, levies, fees and royalties to raise funding that allows financial support to be offered for climate risk assessments; extension services; and start-up or seed financing for new products and services. De-risking investments—particularly large-scale infrastructure investments that support the NAP’s priority areas—will also be crucial to making these investments attractive to private investment. As part of their NAP planning process, governments should try to address these barriers by preparing and mainstreaming a resource mobilization or NAP financing strategy, mapping their adaptation priorities and identifying corresponding funding sources and opportunities. Governments must work to ensure that the legal and policy framework—along with appropriate institutional arrangements—are in place that support investment in adaptation and facilitate dialogue among national and sub-national decision makers, private enterprises and private financiers. First, governments must work to get appropriate institutional arrangements right at the outset of the process, and must maintain them through all three phases of the NAP. This may include involving private sector representatives in the NAP’s oversight committee or establishing structures that ensure communication between this committee and the private sector. This will help to ensure that the private sector is involved in NAP process decision making, and that channels of communication through which governments can raise awareness of and interest in the NAP are open. Second, governments should ensure that the legal and regulatory framework within the country is conducive to businesses engaging in adaptation measures. Governments must ensure that there is stability in domestic laws, policies, and regulations that will influence adaptation investment decisions, and that existing policies, incentives and regulations do not promote maladaptation. Regulatory and policy measures could include offering fast-tracked permitting for adaptation-focused activities, or requiring or encouraging the disclosure of climate risks among companies and investors. Private sector actors may lack the technical capacities needed to participate in the NAP process. They may lack the capacities needed to understand and use climate data and information, and to integrate climate risk management into standard business operations. They may require enhanced capacities in the use of techniques, technologies and equipment needed to adapt, or they may require capacities to develop the business models needed to commercialize adaptation products and services. Private sector actors may not understand how to implement business strategies that can reduce their exposure to climate risk. They may also need help identifying and seeking out appropriate financing for adaptation investments. For private financiers, increased capacities are often required to integrate climate risks into investment portfolios and financing products, and to better quantify and track the adaptation returns on investments. Governments, with support from development partners and business service providers focusing on adaptation, should work to strengthen these capacities, in order to create an environment in which businesses and financiers are able to understand and act on current and forecasted climate change information. Generate climate data and information and communicate it to the private sector: Governments, working with development partners, academia and civil society, should work to generate and disseminate to the private sector information and data about current and forecasted climate change, and ensure that these actors can understand and use the information in their decision-making processes. Ideally, this would be a component of the private sector engagement strategies outlined above. Support research and development for adaptation: Governments can play a strong role in supporting adaptation research and the development of innovative adaptation solutions. This can be done through investments in education and national academic institutions, as well as through the provision of government funding for research programs. Work with the private sector to articulate the business case for adaptation: Private sector actors and governments should work together in partnership to articulate the context-specific business case for investments, whether direct or indirect, in adaptation. This should be done with equal focus on the risks and opportunities presented by climate change, and should draw on the technical capacities of the private sector to quantify the costs and benefits of adaptation action and inaction, to ensure that an accurate picture of a project’s true return on investment emerges. Build the capacity of the private sector to understand and respond to climate vulnerability and risk: Working with civil society and development partners, efforts should be made to increase the capacity of private sector actors to conduct climate risk and vulnerability assessments and to integrate the findings of these assessments into their business planning or investment decisions. Private enterprises and financiers must also fully understand how to respond; they must understand the adaptation options available to them to help reduce their exposure to climate risk and to build resilience into their operations, supply chains and investment portfolios. Use the NAP process as a means of communicating the country’s medium- to long-term adaptation priorities to the private sector:The NAP provides a picture to stakeholders—including civil society, private enterprises and investors—of what the country’s medium- to long-term priorities are for investments in adaptation. It also outlines the policy and regulatory frameworks, including incentives, that will be in place to support public and private investments in adaptation actions. This sends a signal to stakeholders, including the private sector, of sectoral-level vulnerabilities; of the possible implications of these vulnerabilities on communities, public services, business operations, supply chains and investment risk exposure; of where public investments will be made in strengthening resilience; and where financing gaps might exist that will need to be closed with private investment. While governments will continue to drive the nationally-owned NAP process, making that process open and transparent will help all implicated stakeholders understand the role they can play in improving resilience. Explore developing a private sector engagement strategy for the NAP: Where appropriate, governments should use a consultative process during the early phases of the NAP process to develop a strategy or strategies for engaging with members of the domestic and international private sector. This will include mapping out relevant private sector actors; identifying drivers of investment in adaptation, and barriers preventing investment; communicating sectoral vulnerabilities; identifying entry points for engagement; and exploring meaningful partnerships between and with private sector actors. The development of such strategies is underway in a number of countries, including in the NAP processes for Ghana and Saint Lucia. Understand NAP financing needs early, and develop feasible, bankable project pipelines: Through consultative processes, the NAP development team should map out the financial requirements associated with NAP implementation. At the same time, the team should develop—in collaboration with a range of stakeholders including civil society and the private sector—a pipeline of practical, feasible and bankable adaptation projects aimed at increasing climate resilience. A NAP Financing Strategy should also be developed early in the NAP process. Governments should work to ensure that, through this process, adaptation projects included in the pipeline at the behest of certain private sector actors and financed with public funds are not then implemented by those same private sector actors that lobbied for their inclusion; the pipeline must reflect the country’s true medium – and long-term adaptation priorities. Identify and cultivate private sector champions and share stories of success and failure to promote crowding-in: Governments, civil society and development partners should all work to identify those private sector actors that are leading efforts to adapt to the impacts of climate change—Red Stripe in Jamaica, for example—and partner with them to help reach other private sector actors. Governments should encourage peer learning among private sector actors and the sharing of successes and failures with regards to NAP implementation. This includes showcasing those positive stories of private sector engagement that illustrate collaboration and the pursuit of shared adaptation goals. The private sector will play a crucial role in the NAP and NDC processes, and this role must continue to be analyzed, understood and encouraged to build a stronger evidence base of what works and what does not when it comes to private sector engagement in adaptation. The NAP process and the pursuit of NDC adaptation goals—in their planning, implementation, and M&E phases—present a critical opportunity for governments to align private sector interests with national adaptation priorities. Proper alignment would facilitate a longer-term scaling up of adaptation activities across wider networks, distributing ownership among more stakeholders, and ultimately becoming more representative, inclusive and successful.